Our very own Dr Graeme Awcock has won the Inspirational Teaching Award at the 2015 University of Brighton Students Union’s Excellence Awards. Now in its fifth year, the awards highlight the efforts of people students feel make the most positive impact on their university experience. Individual staff recognition at the event shone a spotlight on the commitment and dedication to the student experience across the university. 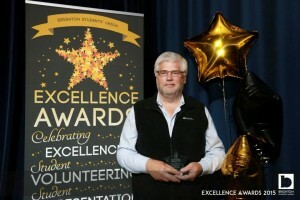 Graeme’s nomination stood out and he received the Inspirational Teaching Award. He was recognised as a ‘true educator’, for his ‘unrelenting enthusiasm’, the outstanding effort he puts in to teaching and for creating a ‘lively environment in which to learn’.